Dr. Morrison and students in Florence in 2012. Ohio University students can spend Summer 2015 in Italy and complete one year of language requirement. Find out more about this exciting Study Abroad opportunity with Ohio University at an Information Session on Monday, Nov. 10, at 6 p.m. in Baker 242. 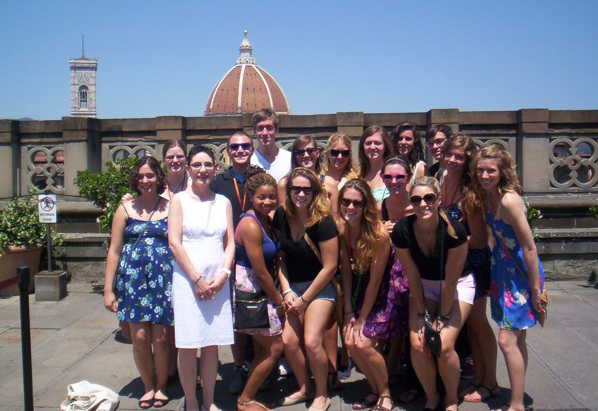 Italian in Florence is a six-week program in Summer 2015 that combines academics with hands-on cultural experiences in one of Italy’s most beautiful cities. Students will complete the equivalent of two semesters of Italian language (offered at beginner and intermediate level) while also immersing themselves in the culture of Italy, with overnight excursions and day trips to Rome, Venice and several other destinations. The information session on Nov. 10 covers courses and credits, application deadlines, living arrangements, costs and everything else students want to know about this fantastic opportunity to spend summer 2015 in ITALY. “You will also meet former participants,” notes Dr. Molly Morrison, Associate Professor of Italian. No appointment is necessary. Just show up at Baker 242 at 6 p.m. this Monday, Nov. 10, 2014. Free refreshments will be provided. For more info, contact Dr. Molly Morrison at morrisom@ohio.edu.